Sometimes a hat can completely transform you; it can give you a surge of confidence which you didn’t have before; it can make you feel stylish and chic and can instantly transform a plain outfit into a striking one. Travelling with a hat is a great idea as it can make you feel just that little bit more free-spirited and spontaneous. Who knows what adventures you and your hat might find yourself on? On this occasion we found ourselves venturing off the beaten track to tulip fields unseen by tourists, getting lost and finding our way back by asking locals and recognising colours we’d seen earlier that day. 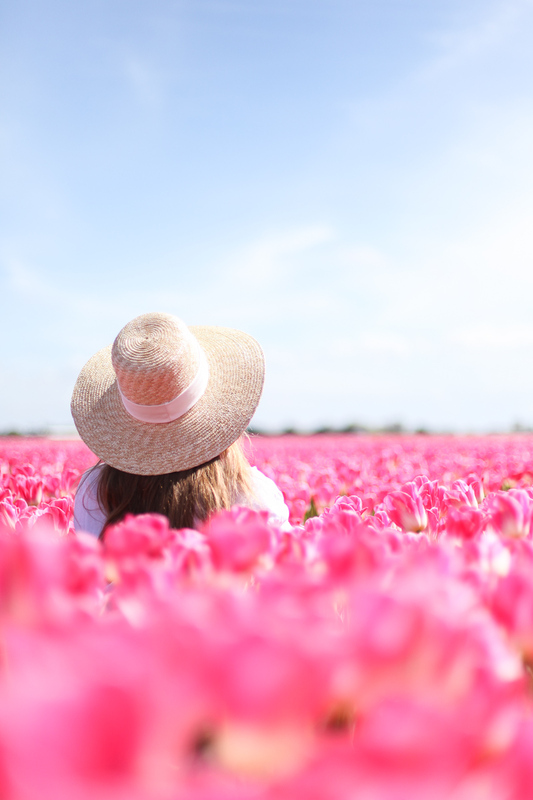 In my eyes there’s no better accessory to a sea of pink tulips than this wide-brimmed summery hat.